I'm breaking this out from my old Epsilon thread because this software has really outgrown it's original scope. 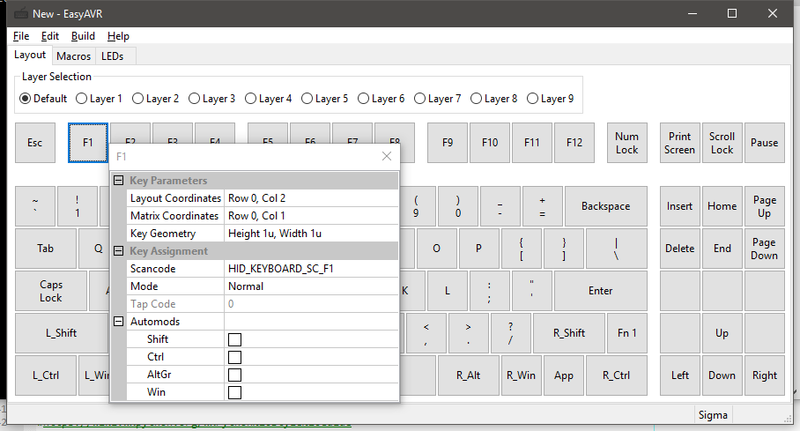 This is a keyboard firmware and keymapping GUI for custom keyboards based on USB AVRs. It's powerful but also really easy to use. Want more? Make a request. Note! This release bumps the EEPROM format version so all settings will be cleared when it is loaded for the first time. Added ability to perform ALT+codes in macros. Add new "scancode picker" to allow easier selection of key assignments. Add new config options for keyboard and mouse timing. A few minor GUI improvements. Last beta version upgraded to release version. Add support for Techkeys card. Add new feature: programmable LEDs. Add ISO layouts for Costar boards. Add ESCGRAVE key for 60% boards. Acts like ~ when shift is pressed, otherwise Esc. Overhaul the configuration of layouts. Users can now configure any layouts they want. Add prototype Smallfry keyboard support. Fix Pegasus Hoof LEDs again. Change debounce algorithm. New version is zero delay. Aikon MX-MINI support? Its an ATMEGA32. Support for my GON 87 NS based on PS2AVRU? Thanks! I don't think that controller will get support. I rely on the USB parts. Could be great to have alternative firmware / programming means. Ok, thanks for looking into it! Quoting me causes a posting error that you need to ignore. Definitely supported but I don't know any keyboards that use that! Added KMAC support. The slower clock in the KMAC causes me to overrun my schedule but it still seems to work fine. Is it a lot of effort to support unique/other layouts? I have no problem using it on the Frosty Flake except that the default speed of the mouse cursor is so damn slow. Double and triple tap the mouse keys to speed it up. Or even four times. After much trying I had to make the lowest setting very slow or it was impossible to make fine-point selections. I kept over shooting the target. Tuning it is tough. Thanks so much for this. I was having a lot of issues building the firmware for my frosty flakes (so I can test them). This will make things very easy to test, which is the biggest issue for me in making keyboards. The problem is relating a layout to a matrix. What does the matrix look like? There are many, many variables. Is that an existing keyboard? If that is something you are planning on building with a teensy, you need to think about the row/column configuration. On a board with that many keys, it isn't trivial. I can probably make it so it can load layouts from an external ini file, but that isn't enough to be able to support anything you dream up. The firmware needs to know how to handle the hardware. First release version. Hopefully I have squashed all the bugs with the new features. Typing this on my KMAC2. Wonder if this would support SPRIT's custom PCB boards? Nope. Sorry. Those aren't USB AVRs. In the distant future, I might combine it with V-USB to support something like that, but it isn't in the cards for now. I've got too many projects. I notice that the led indications of caps and scroll are toggled on the Pegasus Hoof. This signaling need to be fixed. Ah some feedback! Thank you very much good sir. That is one that I don't own, so I need people to tell me when it doesn't work. You mean that they are inverted? Caps LED is on when Caps Lock is enabled, and off when Caps Lock is disabled? Or is it that the Caps Lock turns on the Scroll Lock LED, and vice-versa? Well it isn't done. More of a work in progress. The problem is that I don't own one, and it will never get finished until I have one in hand. I'm thinking about offering to build one for someone. Then porting the code before sending it to them. With a MD GB going on now, now would be the time to advertise making one for someone. If I still ahd mine, I'd loan it to you for testing, then maybe I could get some firmware put on it. Yes, the indications of those two keys are inverted. I tested your program on both frosty flake and pegasus hoof. The inverted indications are only found on the pegasus hoof. That's very interesting. Looking at bpiphany's schematics and code, they should all act the same. Oh well, no matter. This is a trivial fix. I'll have a new beta version shortly. I do love a challenge, but I need more information. What doesn't work? Are you saying that rest of the board works, but the Fn key doesn't? That's probably a mistake in your map. Can you do the USB a.87 aikon controller? I have a nice GON keyboard, and the Aikon software is pretty limited. It's not happening anytime soon I wrote this code to take advantage of the USB AVR controllers and the A87 doesn't have one. When I finish my ongoing projects I may check out a software-only USB stack, but I can't promise anything at this point. I thought the ATMega32 was an AVR USB controller. Isn't it the same chip as the GH60? There are hoops that can be jumped through, but it requires creating a virtual USB hub, which the 32A can do but can't speak USB natively, thus Qaz' software won't make anything useful for it. And Metalliqaz, your software is really cool, but I can predict you'll get a lot of requests for this exactly because your software is good, and the FaceW PCB looks like it will be using the 32A chip. meaning fake USB. I can tell make to compile stuff, but I for one (and I suspect I'm not alone even on a geeky board like GH) and really limited as to how much code I can write from scratch. Have you run across any really basic tutorials that could help a non programmer who's not afraid to do some typing, how to combine v-usb with ... what, TMK? 50P: There are hoops that can be jumped through, but it requires creating a virtual USB hub, which the 32A can do but can't speak USB natively, thus Qaz' software won't make anything useful for it. I can tell 'make' to compile stuff, but I for one (and I suspect I'm not alone even on a geeky board like GH) am really limited as to how much code I can write from scratch. Have you run across any really basic tutorials that could help a non programmer who's not afraid to do some typing, how to combine v-usb with ... what, TMK? Ahh, I didn't realize I had the 32a, it's under the plate and I can't see it anymore. Thanks for taking the time to respond, though. You're doing great work! Yes, I'm picturing a way where I set up the basic hardware (for example, GH60) and then have an option to load layouts from a text-based description (for example, HHKB, Poker, Pure, allkeys). Then I could just publish a spec for using the Teensy or bpiphany's mini controller with the software in one's own project. I tried the new beta version on the pegasus hoof. It is getting worse. Now the Caps LED is on when Scroll is disabled and the Scroll is on when Caps is disabled. What I have before is that the Caps LED is on when Scroll is enabled and the Scroll is on when Caps is enabled. Okay emguy. New beta version posted. Give that a try. Everything is fixed now . I really like the idea of winkey_lock on scoll_lock. Page created in 0.249 seconds with 71 queries.